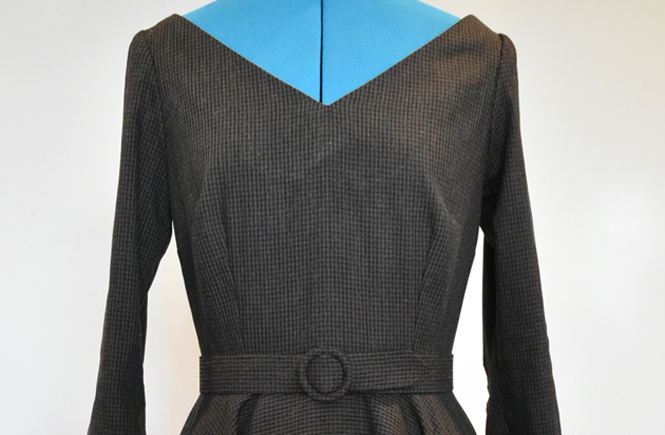 Here is another wool dress with my much loved triple darted sleeve, using a woven wool suiting fabric from ebay and with a design that is very much something that my grandmother would have made and worn “back in the day”. I didn’t use a pattern, it’s just a mash together of my favourite bodice, with a wide cut away v neckline, a 3/4 sleeve and a full circle skirt. The wide v neckline is stabilised to help prevent the bias from stretching out and then further supported with an interfaced deep neck facing. My favourite and best technique to stablise seams without stretching them out further with handling is to use the tutorial by Paco Peralta here on making your own fusible bias stay tape. If I know the tape is going to be used on a straight section like this front neckline, I don’t cut the interfacing on the bias and then pull on the tape firmly as I am pressing it along the seamline to help draw in the neckline very slightly. It really helps to also use top quality interfacing, I always bite the bullet and pay the freight to get my interfacing from Fashion Sewing Supply, it really is worth the extra expense. I usually use either Pro-Weft Supreme Medium or Pro-Weft Supreme Light. I think for this stay tape I used straight-grain cut Supreme Medium with the line of staystitching down the centre as per the Paco Peralta tutorial. And pockets, of course. Here is a closeup of the sleeve darts and you can see the tiny check print clearly. The fabric has a tiny black and olive green check with a subtle white fibre fleck and also slight stretch to it, similar to a stretch cotton sateen. For the neck facing I used some old olive green silk bias to hong kong finish the facing edge. Everywhere else is just overlocked. Due to the slight stretch to the fabric, I needed to take a wide seam allowance as it ended up bigger than normal. Right side out back – I used a centred invisible zip, reinforced with a strip of interfacing. The belt is a self made belt using my last precious self-covered belt kit. I am now scrambling trying find another local source, as I really love making my own belts. A final “twirl” shot with a slightly bemused facial expression. I really love the swirl factor this medium weight fabric gives to the full circle skirt. It was a nightmare to hem of course. My trick for hemming a full circle skirt is just letting it hang for long enough to let it drop and then patience and lots of pins on the dummy. Lots and lots of pins. Often I torture myself and hand stitch the hem but this print ensured any machine stitching is invisible so I just overlocked, turned up a small hem and machine stitched both the skirt and sleeve hems with a 3mm length straight stitch in black thread. It’s a very simple dress but I love the wide neckline and the belt, and its nod-to-the-past style.